I HAVE PEACE THROUGH JESUS CHRIST. will guard your hearts and your mind in Christ Jesus. Life is difficult and then at times it becomes even more difficult, but we’ve been promised peace—a supernatural peace that transcends understanding. That peace doesn’t just happen, we need to guard our hearts and our mind by focusing on Jesus and trusting God. Not trusting God will rob of us of his peace. When life gets hard for you, let this become your mantra. Now you might be saying, “Oh, that’s just one of those platitudes that Christians love to say but they don’t understand what’s going on in my life.” And that’s true. But I know what’s going on in my life. I have brain tumors that have left me almost deaf along with a multitude of other “Issues” that make life difficult. Believe me when I say I could have a permanent pity party and no one would blame me. 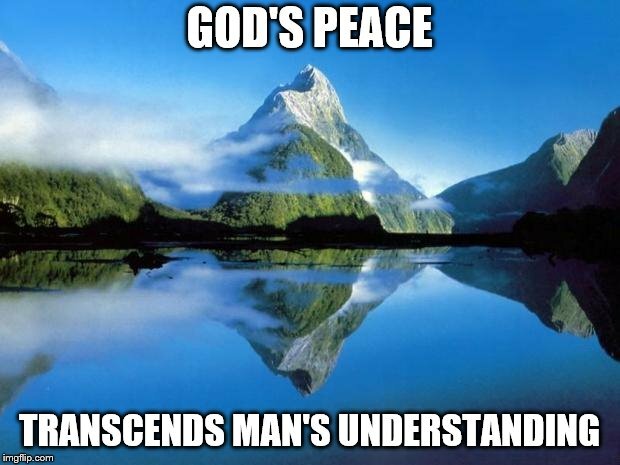 Instead, I choose the peace of God which transcends all understanding. How do I do that? First and foremost, I focus on God and his love and goodness and power. Second, I choose not to focus on the difficult circumstances that I can’t change but to be grateful for all the good things in my life. Previous God is True to His Word!